A recent segment on NPR discussed with New Yorker writer Peter Hessler, who has lived in China for the past 15 years, what it was like to re-enter life in the United States and how United States looks to Chinese citizens. Hessler discussed how hard it is for the rest of the world to understand our complex system of check and balances, of federal, state and local power, of influential groups with non-governmental status. So that raised the question of what governmental websites do to help orient visitors to what the basic organization and framework of government. What if we were visiting from Mars? What would we learn from our governmental websites about how the United States is organized. The Mars test, in taxonomy and information design, is also called the ‘mental model.’ A mental model uses common knowledge or frameworks for creating website navigation. So a good place to start design a US Government website might be with 4th grade civics, which distinguishes Executive and administration, Legislative, and Judicial Branches and explain responsibilities of federal government and those functions reserved for state government. 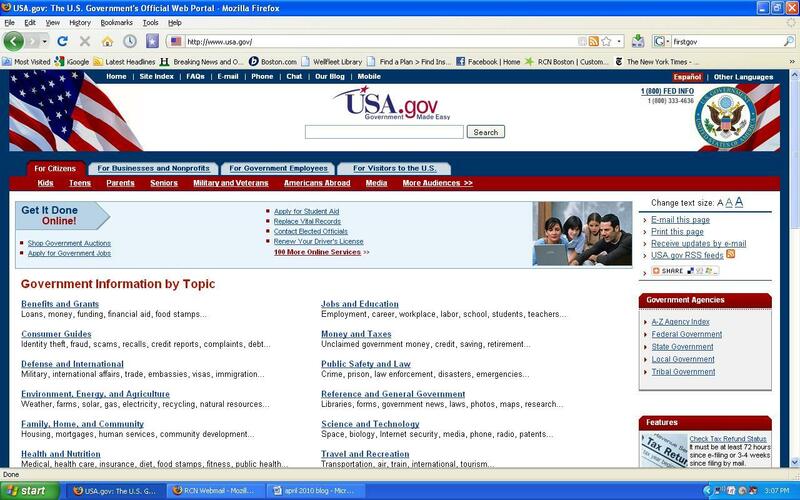 Here is the US Government portal called USA.gov. Does it pass the Mars test? It is a directory like interface that is organized, it seems to me, based on arbitrary topics with no association to government agencies. Where would I even begin to find out about the President of the United States, the new health care bill, the Supreme Court? How do you find a local office of a government office like my legislator’s office or the social security office. In a week where a United States Supreme Court justice retired and volcanic ash disrupted air travel, there is no acknowledgment of these events or links to related website. The site in fact gives an impression that lights are on but nobody is home. USA.Gov.com is actually experimenting with some sophisticated clustering software such as Vivisimo (vivisimo.com). This clustering application illustrates how clustering results can be customized in this case by topic, by agency and by sources. While the topic clusters are automatically generated on-the-fly, the agency and source filters are generated based on HTML metatags. 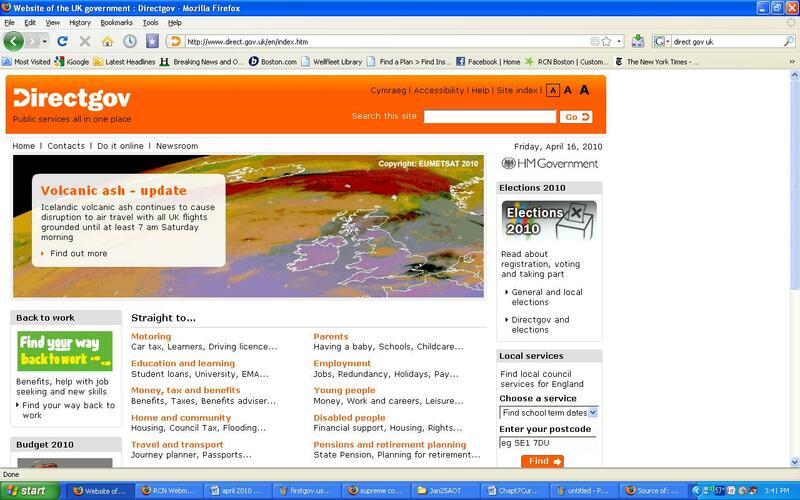 The United Kingdom is experimenting with its own clustered interface but the site also uses RDFa and shared metadata. This system has the advantage of having a reusable metadata model that can allow state and local agencies map their content to the governmental model. This promotes “harmonization” and cooperation in supplying data between federal and state government. Because of this harmonization through use of shared metadata, directgov.uk can enable features such as search by zipcode for local offices that deliver state and local services. Even better, the interface looks like someone is minding the store and cares what content appears on the website. I am not opposed to clustering. Clustering promises to be a great technology to quickly retrieve masses of documents and content, but a little upfront work is needed to filter automated technologies into useful categories that reflect our shared knowledge and common sense. This work would help in creating automated systems that sort results into useful buckets that clarify content and help users find government assistance and solutions. Search.usa.gov is actually an exciting engine that has clustered over 50 million government documents. However it needs a friendlier, warmer interface to the experience. For example search for Supreme Court, and results mixes state courts with the United States Supreme Court. Wouldn’t search experience be improved if the portal to the search engine helpe users understand and filtered searches to distinguish between by federal and state courts. Using common models through taxonomies and shared metadata might not only help the visitors from Mars. It might also help citizens of the United States find a clearly navigable path based on stuff they learned in 4th grade. Last winter, the side airbags in my car deployed for no apparent reason. What does this have to do with taxonomy? Well, the subsequent struggle with both the insurance company and the car manufacturer sent me scrambling to the National Highway Safety Transportation Database (www.safercar.gov) to research spontaneous deployments of side curtain airbags when there was no visible damage to wheels, tires or undercarriage. First, I love government information. Just today I used the U.S. Geological Service and checked information at the Bureau of Labor Statistics but the US Government has to learn how to makeover its picklists and 1.0 databases into an information architecture with usable taxonomies. These ugly ducklings need to become swans. Here’s the problem. In a traditional database, every record has to be unique to avoid redundancy so when multiple reports are filed, all reports are tied back to the original record. Unfortunately, what happens is that the end-user, who is searching for information in a desperate moment of need such as after an accident, has to find that original record. The record I needed which described a research report about 498 similar complaints was filed in 2006 but was filed under the the original complaint (different year and model) which was a record created in 2003. To find the record that contained a research report filed 3 years after the original complaint, I had to use a year that was prior to the manufacturer of my car, and I was unable to search by the specific component failure as a keyword or phrase. I found the record by using a citation from a Google search where I found a news team investigation of a similar event in a different model. Even with the citation, I had to drill through multiple layers four queries deep to find the original record and I was unable to search by any keywords or topics. How would taxonomy have helped? A taxonomy would have helped in 2 key ways. First, content management using a taxonomy provides multiple access points related to the same set of topics and issues. A faceted taxonomy would have provided a useful user interface that would have allowed me to alter my search strategy. Searching by model under the existing database design doomed my search to failure because the record I needed was filed under a different model and a different year. Second, the database would have been designed to consider multiple access points to content without sacrificing the benefits of relational database design. It would have simplified the query programming logic, but still allowed an efficient database design. A good taxonomy design would make it easier to add new facets or terms as technology evolves to search across topics such as environmental issues and engine efficiency. Redesigning picklists into taxonomies is not a difficult task for trained taxonomists and projects can be very cost-effective even in a tough economy. In my case, my search led to thousands of dollars of savings in insurance expenses. In other cases, getting good information quickly will help save lives. The hard part is pre-determining what the categories will be captured in the taxonomy, and how databases will be searched by endusers, but that’s why there are taxonomists who can do usability studies and research existing metadata such as insurance reports and consumer safety databases. The taxonomy can also be used to reindex databases through tools that support entity extraction where the taxonomy can be used to find synonymous terms. After a weekend searching the NHSTA database, I was almost as eager to call the US Government to help provide an “extreme picklist makeover” to transform Web 1.0 picklists into a more searchable 2-level faceted taxonomy as I was to successfully resolve the issue with my vehicle manufacturer. I can’t imagine how anyone without some training or experience would have figured out the logic of the database and constructed a search strategy. By the way, I had a happy resolution with the manufacturer but I am still waiting for the NHSTA to respond to my complaint. One of the changes I am hoping for in the new administration is more attention to our neglected government databases which are in need of “extreme picklist makeovers.” Information has to be easier to find. In some cases, this improved access can save a life, if not thousands of dollars (as was my case).